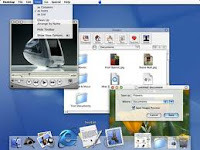 Seen here looking more like a desktop icon*, is the first release of OSX. It's now older than the classic Mac OS (up to 9). I remember the sense of awe at the non-jagged icons, transparency, more realistic-looking shadows and the new traffic-light 'sweeties' in the top-right corner of windows. It really doesn't look *that* dated. That Mail icon has hardly changed, just a bit more kiddie-coloured, and the magnification effect is still there. Glassy-looking buttons were cool at the turn of the century, but by 10.6, the aqua look was looking a bit unnecessarily clumsy. The stripey background of windows and sheets didn't last so long. We had a weird dual-look with the windows. OS9 was already experimenting with the brushed aluminium look. Very different from the more plasticky look of the regular window borders and backgrounds. From memory, I think the human interface guidelines said that the aluminium look was appropriate where the window was to minic a control panel. I really lament the passing of the 3D hyper-real-looking buttons and controls. I regularly use a couple of Macs on Snow Leopard and Mavericks. I get the very 'clean' concept but when you can't immediately see whether some text on a plain white background is a button, input field or just some text, that's just plain unhelpful, however beautiful it looks. WWDC18. Who is Number 1? !